The Good News of Jesus Christ is sometimes soft and consoling, but at other times it is challenging. Jesus is a sign that is contradicted because the false values of the world contradict His beautiful truths. He came to save us from worldly standards so that we might, by His grace, be made worthy to be with Him in heaven. There is a deep beauty in this Icon of the Gospel of Life because it captures some of these heavenly truths that Jesus came to share. These truths often run contrary to our worldly view. Our competitive world says that our egos should be based on being “just as good as anybody else,” which translates to mean that no one should be better than us. Another common misconception is that, “We all will have the same place or reward in heaven.” Both of these lies are enormously dangerous because they deny important truths. God has revealed that it is not what we accomplish that determines our self worth. Nor is our self worth based on some sort of competition with others. Rather, it is the fact that He loves us even though we are sinners and calls us to become His adopted sons and daughters that gives us a worth and a value that far transcends anything that we could accomplish on our own. God is not partial, but that does not mean that we all attain the same place in heaven. Some people will open themselves up to receive more of His grace than others. Jesus revealed in the parable of the Talents that those who grow in His grace will also grow in the capacity to grow even holier still. Matthew 25:14-31. The worldly lie that everyone in heaven gets the same reward can sound comforting because it denies our responsibility to focus on living a holy life here on earth. While some people will place some value on humility, they will often misunderstand what it is. Many people in our culture like pictures of Mary with her head bowed low. However, they can be slow to recognize the beauty of this icon. Many in our culture will mistakenly think that Mary’s prophecy that all generations will call her blessed or that pictures of her on a throne are inconsistent with what it means to express humility. And that is why this icon is needed. We also need to help stir up thinking and dialogue to correct these unfortunate misunderstandings. This icon points to a truth that is contradicted by these false worldly views. This icon is a sign of God’s beauty and His higher truths. Pictures with Mary’s head bowed low, while good as far as they go, tend to present a view that is more agreeable to our earthly perspectives, whereas this Icon of the Gospel of Life shows a more heavenly perspective. It depicts how the Angel Gabriel recognizes Mary’s true role. 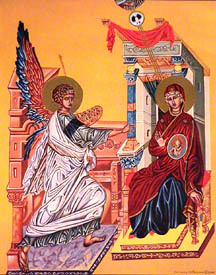 The Angel sees Mary as his true queen and so she is appropriately seated on a throne. She is Queen of Angels and Queen of Men. Pointing to the honor that Mary deserves foreshadows the many different mansions or levels of honor that there will be in heaven and it hints at what God is offering to us if we chose to live a life of holiness. The fact that our culture tends to deny that there are different levels in heaven makes it “easier” to become spiritually lazy. For example, people tend to think: Why make that extra sacrifice if it all comes out the same in the end? If God is not calling us to anything beyond just being saved then why deny ourselves that extra pleasure here on earth to do His will or perform some extra act of love? Unfortunately this belief tends to lower the standard that people expect from themselves and people tend to live up to, or down to the level that is expected from them. 80% of Americans believe that they are going to heaven. Let’s assume for argument sake, that half of them are trying to live a truly holy life and the other half are trying to just make the cut on judgment day to get into heaven. Now, if all other things are equal, from which group is a person more likely to be judged to be on that narrow road that leads to heaven? Cf. Matt 7:13-14. • And most importantly this icon is needed because it clearly, un-argumentatively, and beautifully points to the sacredness of life and when human life begins. This icon is a subtle answer and remedy to these false values that enslave so many people today to living lives of mediocrity. It points to the beauty that comes from heaven. Mary sitting on a throne implies that our role is not to try to become better than others, i.e. better than her, as that would be impossible. It is not about competition, but rather our role is to be the best we can be regardless of what others do. Our role is about being family. We can all rejoice when one does well because their goodness actually helps enable us to become better ourselves. Finding true happiness in life is not about winning against others, but rather about being holy, i.e. it is about being united with God, loving God and others. Some in the church failed to recognize the beauty and the importance of the crucifix. And some churches had them removed. And in these churches it is only because of the grace that God has offered through the Chair of Peter that it has been restored to its place of prominence during the Mass. Our culture does not understand the importance of sacrifice or the true meaning of love. And the crucifix is a powerful icon pointing to these beautiful realities. I believe the same is true about the Icon of the Gospel of Life. Many in the world have wrong notions about humility, true self worth, and the call to holiness. And so, some people do not immediately recognize the icon’s value. Just as the crucifix is a sign that has been contradicted, the same is true of this icon. Our culture is sometimes blind to what it needs. This icon points us toward the truth and is the remedy that our society longs for. Most importantly this icon is a powerful witness to the beauty and the sacredness of life and to when life begins. And if our culture needs anything, it desperately needs that.